What is a Filter Press and How Does it Work? - Micronics, Inc.
Home / What Is a Filter Press and How Does It Work? What Is a Filter Press and How Does It Work? Perhaps you’ve been told that your application could benefit from a filter press, but you don’t fully understand how the technology or filtration equipment work or how it could help your operation. Micronics is the world-wide authority on filter presses and advanced liquid filtration technology. Here, we’ll explore the question – how does a filter press work? We will also examine the applications where they are most frequently utilized, and some of Micronics’ standard and custom filter press solutions. A filter press is a piece of equipment used in liquid/solid separation. Specifically, the filter press separates the liquids and solids using pressure filtration, wherein a slurry is pumped into the filter press and is dewatered under pressure. Basically, each filter press is designed based on the volume and type of slurry that needs to be dewatered. Micronics, Inc. is a trusted expert in liquid/solid separation and offers a wide range of filter press types and capacities to suit specific application needs for trouble-free, economical dewatering. These include configurations such as sidebar automatic, manual overhead, automatic dual overhead beam, stainless steel clad, explosion-proof filter presses, vacuum filter presses, and hand filter presses. 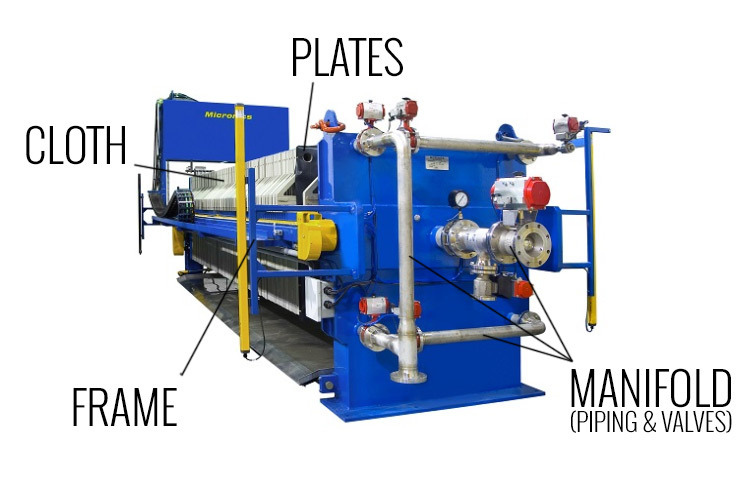 The four main components of a filter press include the frame, filter plates, manifold (piping and valves), and filter cloth, a key ingredient for optimizing filter press operations. The working principle of filter presses is that slurry is pumped into the machine such that solids are distributed evenly during the fill cycle. Solids build up on the filter cloth, forming the filter cake; the filtrate exits the filter plates through the corner ports into the manifold, yielding clean filtered water. Filter presses are a pressure filtration method and as such, as the filter press feed pump builds pressure, solids build within the chambers until they are completely chock-full of solids, forming the cake. Once the chambers are full, the cycle is complete and the filter cakes are ready to be released. In many higher capacity filter presses, fast action automatic plate shifters are employed, speeding cycle time. Some filter presses are specifically designed for fully automatic, 24-hour operation in a harsh environment such as mines or chemical manufacturing plants. The industry, application and operational considerations will guide specifics such as the overall design, filtration capacity, number of chambers, filter plate size, materials of construction, as well as additional features/systems such as automatic plate shifters, cloth washing system, drip trays, cake shields and safety light curtains. Design of a filter press depends on a host of factors such as filtration cycle time, cake dryness required, cloth life, whether manual or automated plate shifting is desired, and many other factors. If you’re interested in learning more about how a filter press could be customized for your specific application, contact Micronics, Inc. today. Or we may have just the right standard or used filter press in-stock to meet your needs today. Contact Micronics, Inc. today and benefit from our engineered filtration experience.